The Co-operative System had its origins in the working-class areas of England. With the majority of the miners on the South Maitland Coalfield having their origins in Britain, they brought with them to this country their solidarity, militant trade-unionism, and a strong belief in the co-operative institutions that had been so much of their life in the Old Country. Co-operative Societies and Stores were established at Kurri Kurri (in 1904) and Cessnock (in 1907), with branches throughout the neighbouring villages. 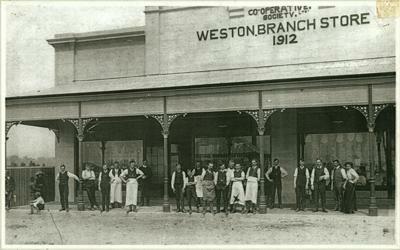 The frequent industrial disputes between the miners and mine owners encouraged trade-unionism in the Hunter Valley, resulting in the growth of Co-operative enterprises, through which the men and their women folk were able to use the Stores as valuable weapons during their struggles. Photo courtesy of Coalfields Heritage Group. Click photo to see the full sized image.